Born in Rio, he has a B.S. in Astronomy, and a Master’s and a Doctor’s degree in Physics. He works at the Rio de Janeiro Planetarium as Head of Astronomy, where he oversees show production, exhibits and the general scientific content produced by a staff of twelve resident astronomers. He specialized in Fundamental Astronomy, Chronology and Cosmology. He has six published books. For six years he was the Scientific Director of the Association of Brazilian Planetariums, and later became its President. 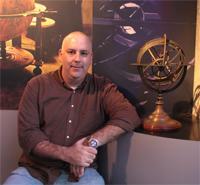 Since 2007, he is the Brazilian representative at the International Planetarium Society Council. In 2012, he was awarded an IPS Fellowship. O primeiro voo do ônibus espacial Challenger foi em 1983. Este veículo realizou nove viagens ao espaço até explodir após a decolagem para sua décima missão, em 1986. Sete astronautas morreram.